As deadly flames from a wildfire whipped through a narrow mountain gorge last fall, threatening Chimney Rock Village and the Lake Lure community in North Carolina, Roger Hollifield put out a call for help. The Party Rock fire was so large and so erratic, Hollifield knew he needed to stay one step ahead. And so, for 24 hours a day for nearly two weeks, a rotating crew of Duke Energy lineworkers remained on call near the front lines. And again and again, the calls came. The lineworkers went in ahead of the flames to cut off electricity in threatened areas. That way, firefighters wouldn’t have to worry about coming into contact with live wires and no live wires would be able to act as conduits and carry flames into homes and businesses. One day, a crew of firefighters and their trucks became stranded by downed trees. The lineworkers cleared the road. Firefighters, in turn, cleared brush and leaves from around electrical poles so there would be less chance of the poles catching fire. 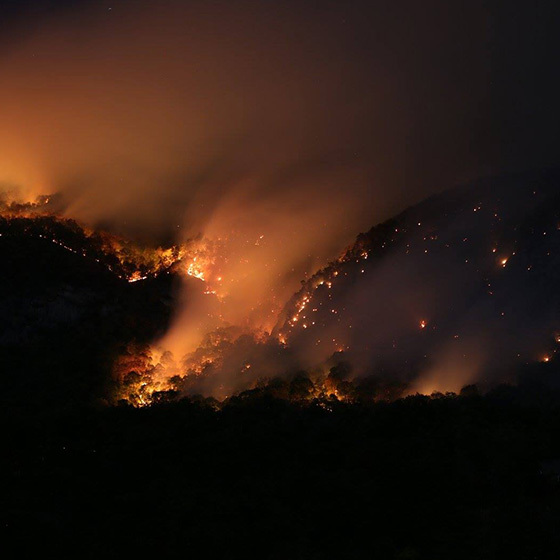 The fire began Nov. 5 near a stone-faced ledge called Party Rock that overlooks Lake Lure, about a mile away. 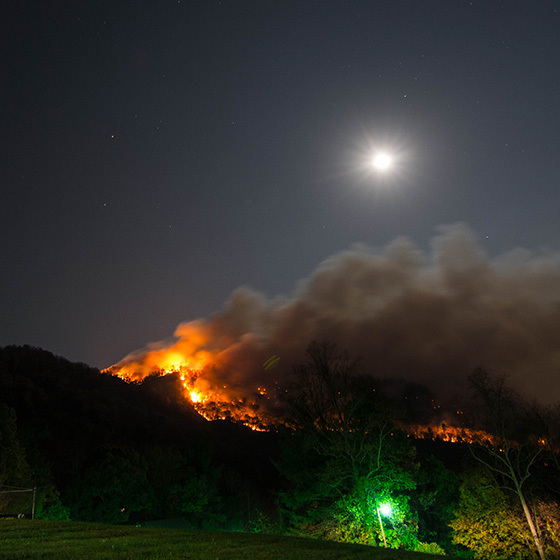 It burned for 25 days over 7,800 drought-stricken acres in Rutherford, Henderson and Buncombe counties. 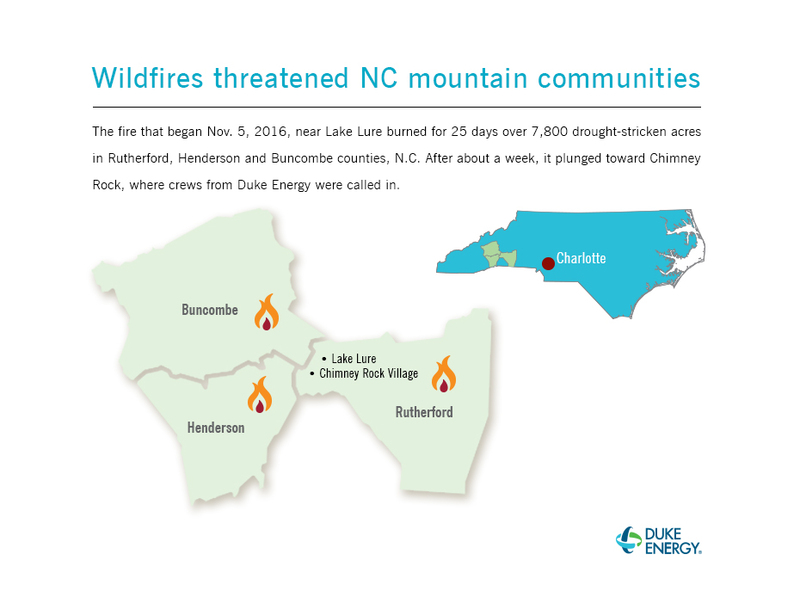 After about a week, it plunged toward Chimney Rock, where residents were evacuated and crews from Duke Energy were called in. 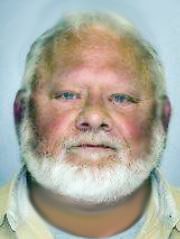 “As the fire burned down around the homes,” Hollifield said, “we just kept moving from one house or business to another. Dan Brandon of the N.C. Forest Service was incident commander, overseeing more than 900 firefighters who came from across the United States to battle the blaze. He credits Hollifield with the foresight to call on Duke Energy to join the team. Duke’s rapid response helped save $100,000 worth of electrical infrastructure. Afterward, the company donated $75,000 to a new Western North Carolina Firefighter’s Fund to help replace damaged fire-fighting equipment and pay for fire-related expenses. And a whole lot for teamwork.